The entire shop is set up like a boutique jewelry store. 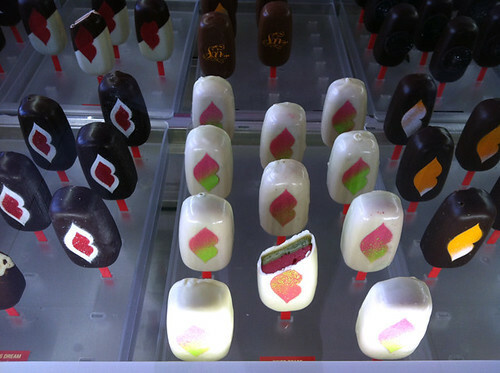 Ice cream bars are set behind glass for you to ogle. The only thing missing a security guard to watch over any unsavory characters. The bars are made with high-quality ingredients: Belgian chocolate, Manila mangoes, marscapone, etc. If you order four or more ice cream bars, they pack it in dry ice with an assurance that they will last for several hours. Now that’s fancy! Even with all those items factored it, it hits you right in the gut when handing over $5+ for an ice cream bar. 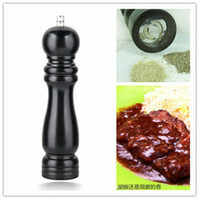 With its red stick and intricate design, I hate myself for wanting to eat something so fleeting. But I went ahead and did it anyways. 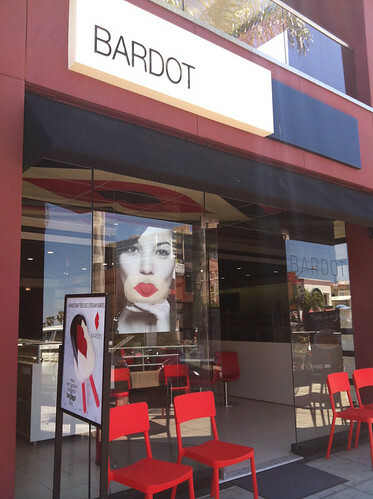 The Scarlet Letter ($5.80) is part of their higher end Bardot Collection. 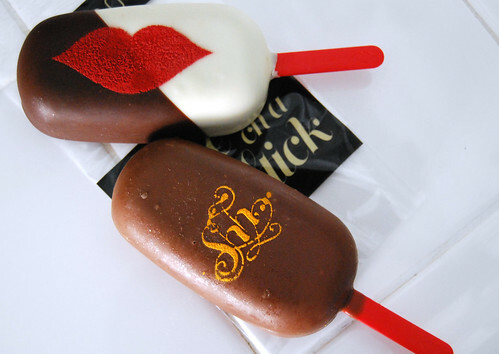 If there’s a flagship ice cream bar for Bardot, this is it. With its lipstick design, it’s similar to what the model on the display window is holding over her own lips. The bar is made up with dark, milk and and chocolate layers and a nice coating of chocolate. Despite its looks, it’s underwhelming even with its visible stacked layers seen after one bite. But the Ebony & Ivory ($5.40) is a different story and is included in their lower (but not much lower) priced Classic Collection. 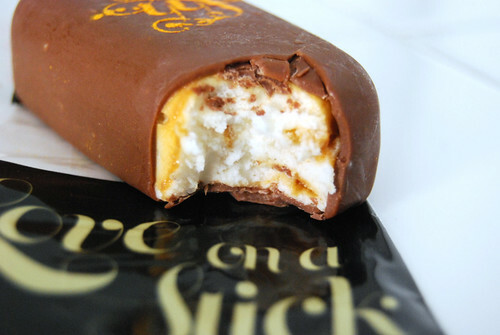 Marcarpone and dulce de leche make up the interior of the milk chocolate-covered ice cream bar. There’s a tiny hint of saltiness that doesn’t distract from the creaminess. It’s a complex taste and being a fan of anything dulce de leche, it left me licking the stick, not wanting to waste an ounce of deliciousness. Other cleverly named ice cream bars available at Bardot include The Heart of Darkness (chocolate), Lucifer’s Dream (marshmallow) and Mr. Wilson (coconut). They all sound delicious but trying them all requires a bigger stomach and a hefty pocketbook. An alternative to breaking the bank on these pretty bars, Magnum sells a comparable product that’s a fraction of the cost, is available at most grocery stores and often have limited flavors available. Unfortunately, it doesn’t come with a view of the ocean. 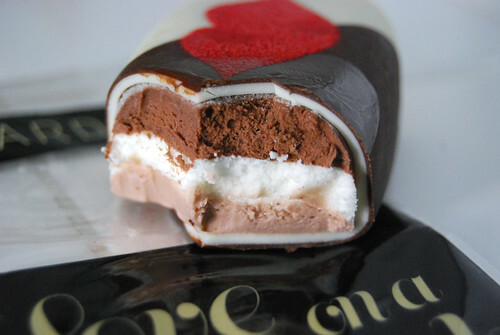 Those ice cream bars are beautiful. Almost too pretty too eat but for $5 AND having to go into La Jolla, it’s too much. I agree! But they were delicious. I haven’t been able to bring myself to try these out. I think that Vivapops are a bit pricey and they average about $3 a pop! Despite that though, they are some pretty looking bars. I forgot about Vivapops and I agree that $3 is a bit much for them too. If I recall correctly, they’re pretty small too. I’m surprised this place is still around but i guess the Richie Rich’s in La Jolla can afford these. I’m so embarrassed I paid so much for just two pops. Over $12! Sheesh. But at least I tried it. It was for “research” purposes. 😉 i’ve been guilty of the same thing at other places….